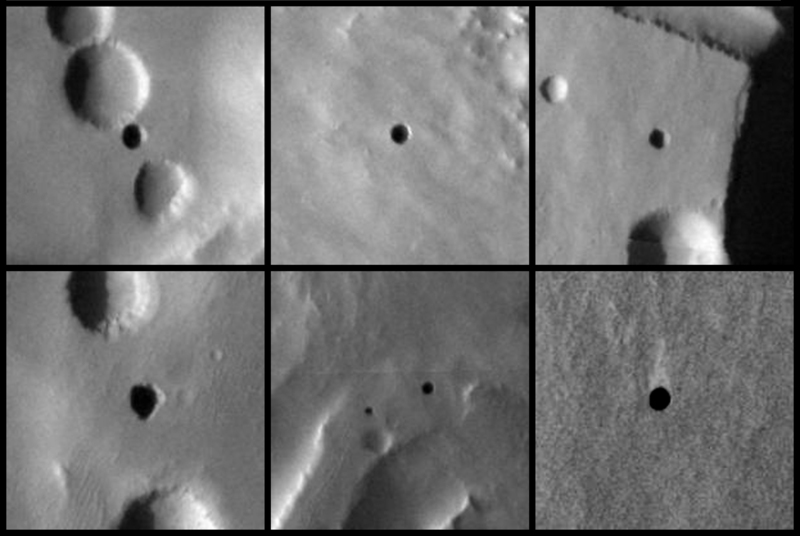 Well, now we have some better martian news: Mars Odyssey appears to have found many new cave openings on the surface of Mars! The possible cavern entrances (called skylights) were found by looking for warm spots on the surface during the martian night. The surface of the planet cools rapidly after sunset, but caves don’t have rapid temperature variations. By using a thermal (infrared) imager, scientists were able to spot the cave entrances. They then looked at daytime images taken in visible light to spot the shadowed openings. The image above shows six of the potential cavern openings. They are all located on the north slope of the volcano Arsia Mons; you’d expect caverns in such a location. The first such skylight was found a few months ago by the Mars Reconnaissance Orbiter. Amazing, isn’t it? They really are craters! This shows a very important point: you cannot always trust your eyes. You have to understand how the brain works too before interpreting images. Otherwise you might make a mistake, and the data are always prepared to fool you.